That’s the only way to describe the roster of High Woltage Caballers, the new team that ran rampant through Gold Qualifiers by sporting a roster of who's-whos in WGLNA. ToFuSmurF (Simple Tankers), Blueboyzcaptain (SIMP), HeavyTwenty (SIMP), fej (SIMP), Oxmathus (RBIS), Wallhacks (Simple Tankers), Anfield (Googleybobbers), Angry_Guy (Simple Tankers), and Ant_PRO all joined forces with one mission in mind: Win. But what exactly is a High Woltage Caballer? And more importantly, do they have the chemistry necessary to take it all? Wargaming’s Jon Robinson sat down with team captain ToFuSmurF to find out. Wargaming: How did the idea to form a super team of star players come about? 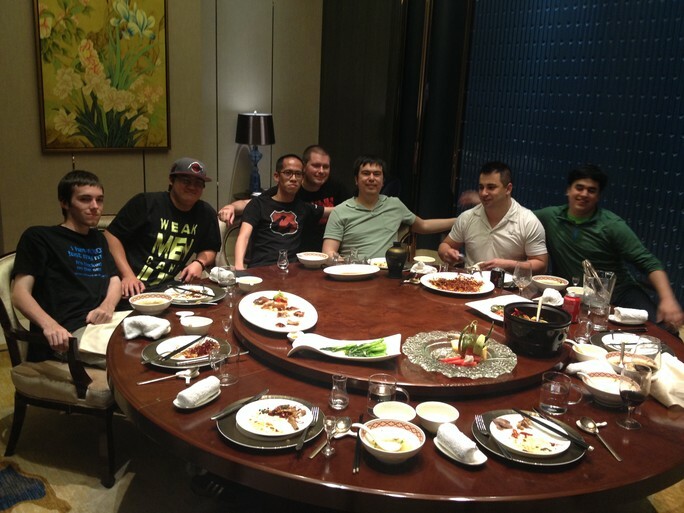 ToFuSmurF: It started with the core group of me, Blueboyz, HeavyTwenty, Fej, and Wallhacks. We’re all really good friends and we actually brought up the idea of doing this about a season and a half ago, but with everybody already committed to their teams and with the way the seasons play out and how the Grand Finals points work, we had to wait for a full cycle of seasons before we could pull this off. Wargaming: How did you know the mix of gameplay styles and personalities was going to work? ToFuSmurF: We didn’t. [Laughs] That was probably our biggest fear coming into this season, as we weren’t sure how things would mesh. When we were doing tryouts for our team, they were pretty grueling just to make sure everybody on the team was up to par and could play together. Wargaming: What exactly is a High Woltage Caballer, anyway? ToFuSmurF: It started with a username we saw in a Tanks game once that we all thought was funny, then it evolved into a thing where we would use Woltage as a measure of someone’s character or likeability. If we were all hanging out and someone was acting rude, we would say something like, “Their woltage is very low.” On the flip side of that, we consider everybody in our group someone with “high woltage.” From there, "Caballers" is just a play on words. We used to all meet in a Skype group we called the "Cabal" because it was a semi-secret room where we’d all meet and help each other with strats. Since we were never on the same team, we would go into this chat room in order to meet up and help each other moving forward and making advancements with our games. Wargaming: Did you consider other team names? ToFuSmurF: Guys were kicking around different names before Qualifiers, but we couldn’t come up with anything. Ox wanted us to be called “Dumbos” because we were just a bunch of idiots playing the game together. Wargaming: Where do you see your team stacking up against the rest of the league? Do you already consider HWC one of the best WGLNA teams? ToFuSmurF: From a perspective of not being cocky, I wouldn’t say we’re the number one team already, especially since we’re still in the period of getting all 10 guys to mesh together when we play. I think from the perspective of potential, there’s definitely a ton of potential with our team. We have a lot of great minds for the game here, a lot of good players, and more importantly, the genuine will to win. We have a lot of guys here who really want to excel. We’re not here just to goof around and do this casually. We’re here to win. Wargaming: How do you think eLevate’s addition of the three Schoolbus players will shake up the league? ToFuSmurF: Those three additions were out of left field. When we found out about it, we were really surprised, but at the same time, there’s a zero percent chance that anyone would consider this a bad move. These are three guys who have a lot of experience playing this game, and these are three very good players. It really opens up the league to future moves like this. A lot of teams know now that if they can be looked upon as a good team, as a team that can compete, they have the potential to attract talent from across the world. It’s like any Clan in this game. Any top Clan can recruit top talent because everybody wants to play for a top Clan. In this case, the better you play, the better the talent will want to come play with you. It’s great for the league. Wargaming: With more and more people playing Fantasy Tanks, what advice do you have for players looking to pick up some players from High Woltage Caballers? ToFuSmurF: Just from watching Week 1, the people who were picked were the same people who were picked last season: Blueboyz and HeavyTwenty. You can only pick two players per team, and these two guys perform well every week, every season. If I was picking, I wouldn’t expect a drop-off from those two guys. After that, look for Ox, as he was the top performer on RBIS, and after that I know Anfield was also a popular fantasy pick in season’s past, and I expect the same going forward. With our team, it’s really a crap shoot because you never know who is going to score the most points. We don’t look at maps and have something like a HeavyTwenty spot where only he goes to do damage. When we go into a match, we have seven guys who know every spot, and are expected to know how to play every spot. You really can’t go wrong picking any of our guys. We’re all going to score. Wargaming: How serious do you look at your fantasy scores? Do you pay attention to how much you guys are added and dropped? ToFuSmurF: We do it jokingly, just to give each other crap about who has the higher owned percentage. We joke about who everybody likes more than the other, but that’s about as serious as we take it. We’re more concerned about getting our wins. If we do that, everything else falls into place. I know some guys take it more seriously than others, though. Overtly, we all joke about it, but I get the feeling that inside, some of the guys around the league really, really care. I don’t think they’ll admit it, but I get that feeling. Wargaming: What else should fans know about High Woltage Caballers? ToFuSmurF: We have the goal of winning, so we don’t really have an off day. On match days, we’re playing our best. On days we don’t have matches, we’re practicing morning or night. There are even times in the middle of the night Wallhacks will come up with a new strategy and will ping whoever is awake to try it out or take a look at it. Our team’s entire focus is on winning, and it was great to see so much support right from Week 1, not only for our team, but for our individual players. Blueboyz and HeavyTwenty had a lot of fans from their old team who are now supporting us and it’s great to see. We’re proud of the way we play, and we want to continue to win over the fan support. One thing to watch out for is we’re adding a new player. We had JoJo drop out due to a work scheduling problem. He couldn’t do the season because of a work promotion, so good for him, but that means we had to go into the season with only nine people. After this week, we will be adding DaKillzor from the EU server. He used to be the leader and caller for Penta Sports. We’re excited to have that happen because he brings a lot to the team. He’s not only a great player, but because he was a team leader, he has so many great ideas. He brings a welcome, contrasting viewpoint on strategy, so now when we team him with Wallhacks, that gives us two guys to bounce ideas off each other, and I think that just makes us even stronger. I can’t wait to show fans what we can do once we have our full team.